In the case of the Sankey version the text reads 3" 76 mm, Richard Sankey & sons Ltd Bulwell Nottingham Made in England. Ward, Darlaston, 3"-7.5 cm, Bilston 41991, Wednesbury West Midlands. Please bear in mind that the two types of rim shown were chosen with drone egg use in mind (the step in the inner rim being at just the right point for the combined drone and worker foundation). 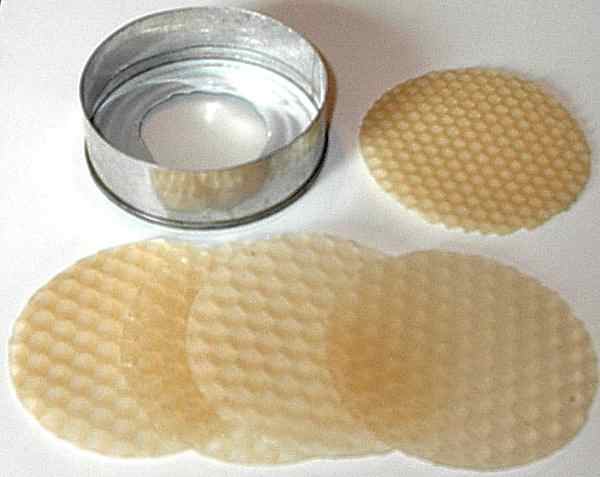 Petroleum Jelly is used on the inner face of the outer rim and the outer face of the inner ring to facilitate easy removal. When the inner and outer are nested there is adequate friction to hold them together. Worker comb can be cut using a "cookie cutter" (I made one 73 mm in diameter from an empty fruit can). The resulting roundals of comb can be shaped and fixed using a modified soldering iron. 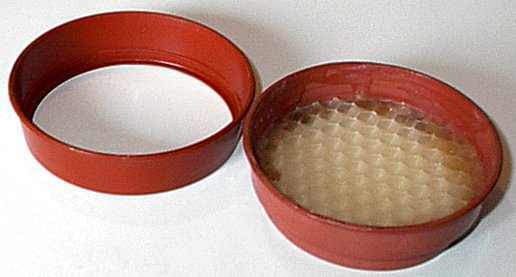 This fixing can be made more secure by "painting" melted beeswax on the inside of the rim. The drone/worker version is drawn from special foundation that is attached to the step in the rim (early trials so far have used drone foundation fixed from the large diameter side with a smaller disk of worker foundation fitted into the smaller recess). The reason for the extra complication of worker cells in the minor portion was to stop the cells being used to raise drones back to back as these small transplant units would be ending up in combs that were only as thick as back to back worker brood. The resulting small cells tend to be filled with pollen and nectar (which is convenient). The following photo shows an outer rim on the left with an inner rim that is fitted with drone foundation on the right. This photo shows the 'cookie cutter' with round pieces of worker and drone foundation that have been cut out of larger sheets by using it.